» Home » Travel & Accommodation » Enjoy Vancouver! Vancouver has been ranked as the third most liveable city in the world: convenient public transportation, easy access to parks and natureSage Restaurant, UBC Campuspreserves, beaches, world-renowned restaurants, and more. In addition, Vancouver has undertaken an initiative to make it the greenest city in the world by 2020. It is also the largest city in Western Canada, located at the southwestern corner of the province of British Columbia. Situated between the North Shore and coastal mountains and the edge of the Pacific ocean, Vancouver is recognized as one of North America’s most beautiful cities. The UBC campus is located at the end of a peninsular with a breathtaking view of the mountains and walking distance to several beaches. With public transport one can get to more urban neighborhoods with plenty of nightlife and restaurants, like Kitsilano (close to Jericho Beach) in about 20 minutes and downtown in about 40 minutes. The vibrant downtown core offers all of the amenities of an international destination — from hundreds of restaurants and clubs, to countless parks and recreation facilities, to world-class entertainment. 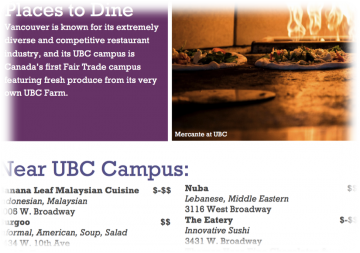 UBC’s downtown campus, UBC Robson Square, is also located in the heart of the city. 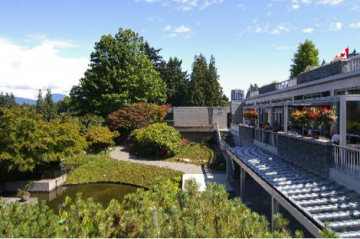 We hope you’ll have an opportunity to explore some of the many local attractions in and around Vancouver while you are here for the ICPIC 2015 Conference. For your convenience local foodie Parmis has put together a list of delicious suggestions.